A GINGERBREAD village on display at McAuley Place in Naas drew large crowds to its annual Christmas Fair on 24 and 25 November. The individual houses were crafted by local kids during six workshops held over the five days leading up to the fair, coordinated by local artist Anna O’Sullivan and using kits supplied by McAuley Place. 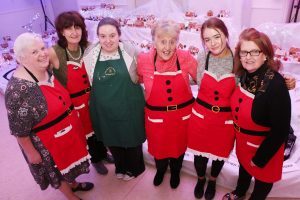 Alongside the gingerbread village – which was lit up by fairy lights and included train sets in a fantastic display – the fair featured a visit from Santa and a variety of stalls in McAuley Place’s arts and culture centre in the old nuns’ chapel. The majority of stallholders were from the locality, selling items including Christmas decorations, jewellery and aprons, while a local transition year mini-company brought along some cute dog bandanas. Alongside an opportunity to foster some community spirit and raise much-needed funds for McAuley Place, the Christmas Fair and village display was a great occasion to showcase what they offer in Naas. McAuley Place provides independent living for people aged 65 and over, with 53 self-contained one-bedroom apartments, as well as convent tea rooms, a community centre and the Renaissance charity shop. “It’s great for us because it gets us out there,” said Ms O’Sullivan.